The shape optimization calculation for steel elements can be performed in Advance Design considering the condition of maximum deflection. Then, new cross-sections are searched if the deflection ratio is greater than the set limit (default 100%). Thanks to this option from Advance Design, it is possible to optimize steel elements while using more criteria at the same time, like searching and selecting for profiles that must meet the conditions for maximum load capacity (strength/stability) and maximum deflection, independently or at the same time. This is especially useful for design of steel structural elements that exceed the maximum deflection while meeting the load capacity condition. 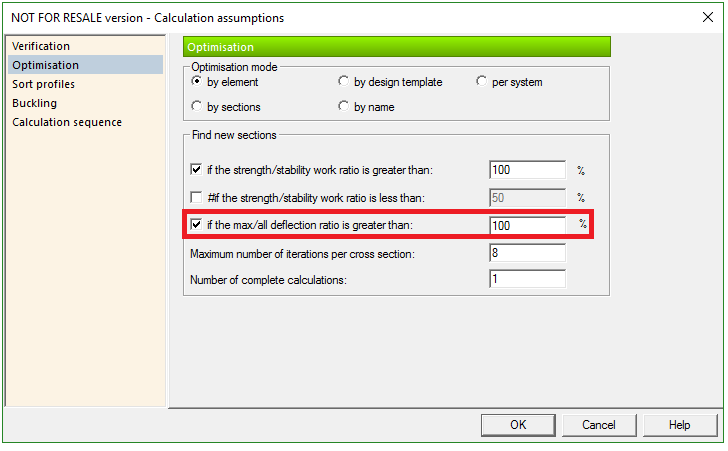 The optimization assumptions can be found in the Optimisation tab from Steel Design Calculation Assumptions dialog. 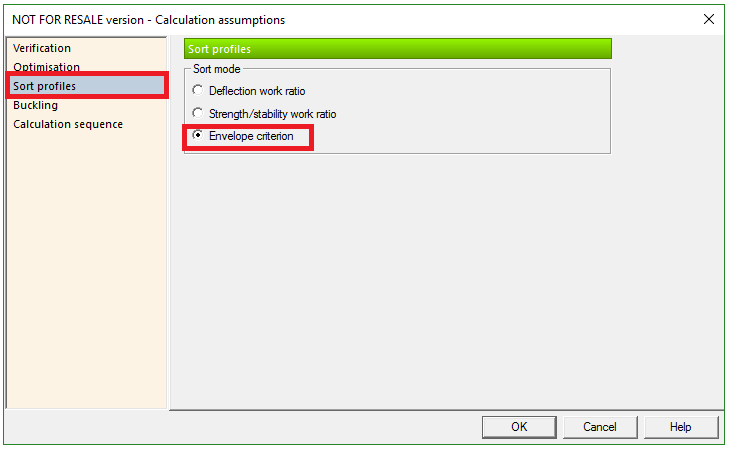 Under the “Find new sections” paragraph, a new option is available to activate the deflection criterion and to set the maximum allowable deflection ratio considered for the cross section optimization. These assumptions apply to all steel members from the model which have Steelwork DeDefault optimization assumptionssign option from the element's properties activated. The limits imposed in this tab apply to all cross sections as a group and cannot be applied differentially for singular element. 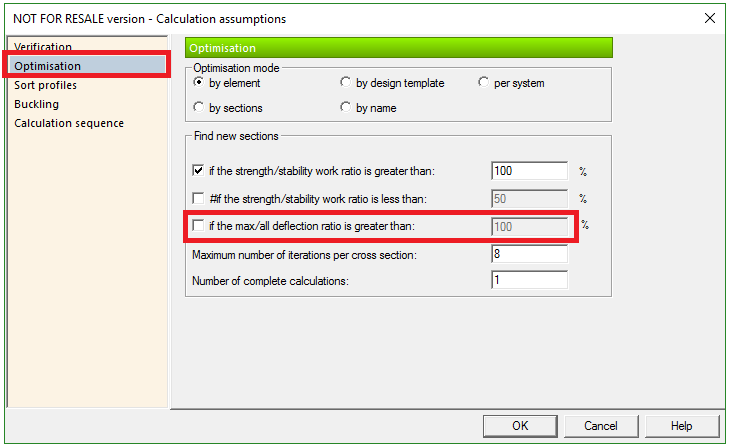 By checking the “if the max/all deflection ratio is greater than:” option, the user can impose the maximum ratio. Once the steel calculation is completed, the strength/stability and deflection work ratios of steel elements are compared with the specific criterion, and other cross sections that meet the imposed conditions are suggested. The results of steel elements optimization are displayed in the Suggested shapes dialog, displaying the current strength/stability and deflection ratios. If the ratios are greater than the imposed limits (100% by default), the current ratio is displayed in red. For such cases, if the deflection criterion is activated, the next cross section from the catalog that will meet the required criterion will be suggested, displaying also the ratio for that section. By opening the Accepted solutions flyout, we can select the suggested shape or other section from the same catalog. After accepting the suggested (or imposed) sections, from the Accept all option, a new steel calculation is required, in order to recalculate the new sections and have correct results in the shape-sheet of the elements and reports. This optimization sequence is directly dependent with the sorting mode selected in the Sort profiles tab from steel Calculation assumptions. By default, the “Envelope criterion” option is selected, which means that the suggested profiles will meet both deflection criterion and strength/stability criterion. If the deflection verification is unchecked for an element, then “N/A” (Not available) message will be displayed for the Deflection work ratio in the Suggested shapes dialog. This new feature makes result checking easier, thanks to the possibility of presenting a ratio for deflection during shape optimization. It also gives you the possibility to select optimal steel profiles considering the deflection. Various options from the Assumptions dialog help you get specific results for the steel elements used in design and enhance the workflow.